External interference injection for optical stress eye generation. 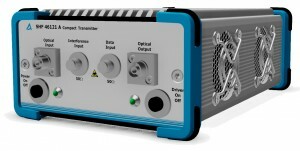 Combining the jitter injection capability of the clock synthesizer, adjustable output amplitude and pre-emphasis feature of the BPG, and now the broad band optical transmitter, the set up can support a comprehensive range of stress tests required for 100G modules and components. The full data sheet can be downloaded at our BERT & Extension Modules section.